In her work, Kannisto attempts to explore the relationship between nature and culture and the theories and concepts which are used to approach the nature within the arts and sciences. Her way of taking the photos as though they were field studies and showing the 'set up' of the studio adds a personality and perspective to the objects that we don'y usually see. 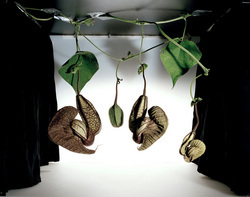 For example in contrasted with Irving Penn's work, they both seem to have similar lighting conditions, similar set up in terms of the studio equipment (light box and high quality camera) and the same subject matter, however Kannisto's work almost personifies the flowers, making them seem more like models and living subjects than high detail structural forms in Penn's work. With this set I started to move away from the macro work and experiment more with seeing how people perceive inanimate objects. I wanted to take photos of simple things such as the art doll and a microphone and apply the type of technique I would use if photographing a person, paying attention to the lighting and positioning of the objects, therefore raising the question of weather you can give an object a personality and how lighting and surrounding can effect peoples perception of this. This set is a pretty linear approach to this idea, but I hope to further it by maybe playing with the objects more, looking at peoples attachment to it and changing the setting and lighting.